The Chart of the Day belongs to MeetMe (MEET). I found the social network website stock by using Barchart to sort today's 52 week high listfirst for stocks with the highest technical buy signals, then I used the Flipchart feature to review the charts. 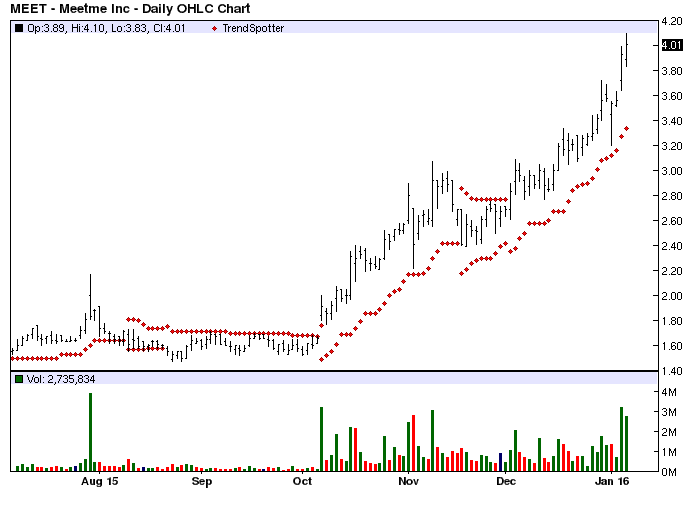 since the Trend Spotter signaled a buy on 12/2 the stock gained 41.70%. MeetMe, Inc. owns and operates a social network. It enables users to meet new people through social games and apps, monetized by both advertising and virtual currency. The company operates MeetMe.com, Quepasa.com and MeetMe apps on iPhone and Android. MeetMe, Inc., formerly known as Quepasa Corporation, is headquartered in New Hope, Pennsylvania. None of the regular technical trading strategies have been reliable so a trailing stop loss of your choosing should be used to protect your profits.